I am beginning to feel better about the Presidential race. The thought of a President Mitt Romney is sufficient to cause my insides to curdle. But now, with Superstorm Sandy and Barack Obama showing just how presidential he could be, Romney might just be stranded in left field sucking on a mop. Do you recall the race between Daddy Bush and Bill Clinton in 1992? George H. W. was accused of being too patrician for the White House. If he was too patrician, what about Mitt? If you haven’t already, move money from Cayman Islands to Swiss account. People, this is why we only build houses on top of cliffs. No generators at Home Depot. I have ordered Paul Ryan off the campaign trail to power my home with a stationary bike. This is a time for bipartisanship, despite the President’s bungling of this preventable natural disaster. Hurricanes are best spent overseas, visiting your money. Remember, the most important threat facing the east coast is and always will be Russia. My thoughts and prayers go out to 53% of you. What are you people complaining about? This wind is no stronger than one of my medium sized helicopter rotors! As you may (or may not) know, I am and always have been a devotee of the stories, poems, and essays of Argentinean writer Jorge Luis Borges. Here is a poem in which he tries to bring a tiger to life through sheer artistry, but fails—or does he? Last year around this time, Martine and I were in Buenos Aires. Because she was curious about guanacos, we visited the Buenos Aires Zoo in Palermo at Sarmiento and Las Heras. Now that was the same zoo where Borges would visit before the days of his blindness set in to see the tigers. He would write frequently about tigers, even titling one of his books Dreamtigers. The above poem is probably my favorite of all. Ghosts and Goblins and Skeletons, Oh My! Halloween Exhibit at the Grier Musser Museum in L.A.
It’s that time of year again: Halloween, becoming an ever more important celebration in the calendar of the year, is almost upon us. I have prepared for the festivities by reading four horror classics: The Island of Dr. Moreau by H. G. Wells and a trio of stories from Edwardian horror writer Algernon Blackwood, namely The Willows, The Wendigo, and The Listener. Then Martine and I capped it off by visiting the Grier Musser Museum on Bonnie Brae Street close to Downtown L.A. Ray and Susan Tejada have purchased a Victorian mansion with which they have family associations and filled it with collections of antique and recent decorations pertaining to the seasons. At this time, it is full of eldritch Halloween exhibits, including animated figures, dolls, puppets, old greeting cards, and horror film tie-ins. The whole place is jammed full of ghosts, goblins, mad scientists, monsters, skeletons, and demons. As for Halloween itself, it’s a working day. In the evening, if it’s anything like the last fifteen years, there won’t be any trick-or-treaters. The schools have been very effective at alerting parents that the practice is dangerous, what with so many child molesters about. Parents are afraid their children’s candy will include rusty razor blades or strychnine. Instead, there are Halloween parties at the schools which include a distribution of “safe and sane” candy. I remember going trick or treating when I was a kid. I had an old blue cub scout shirt, to which I had my mother sew some impressive epaulets, and wore a Union army cap. My disguise: A Civil War and Old West Cavalry officer. I didn’t bother wearing a mask—too uncomfortable! I liked the costume because I was a devoted fan of such TV series as Rin-Tin-Tin and F-Troop. And I got a ton of chocolate, candy corn, popcorn balls, and apples. So, instead of rustling breakfast up for myself as usual, I drove out to the Farmers’ Market in Santa Monica at Pico and Cloverfield. There, accompanied by a thermos of my own unsweetend Darjeeling tea, I had two pork tamales from Bertha’s Famous Tamales, well slathered with their fiery hot sauce. Then I bought some Deglet Noor dates, some Asian pears, and some Fuyu Persimmons. Lunchtime I took a chance with my little sweetie. We went to Attari Sandwiches in Westwood, a busy Iranian sandwich shop where I had a mortadella sandwich and their delicious home-brewed iced tea with lime and mint. Martine had a chicken sandwich which she did not much care for. If I were in Teheran, I would have no difficulty adapting to their delicious cuisine—except I would eat too much Basmati rice, which is more or less forbidden to me because of my Type II Diabetes. Martine, on the other hand, would have a rough time of it. I had to make it up to Martine for taking her to a lunch spot she didn’t care for, however much I love it. For dinner, we went to Pepy’s Galley located in the Mar Vista Lanes Bowling Alley on Venice Boulevard. Pepy’s is an American/Mexican comfort food restaurant where Martine could get her hamburger steak, mashed potatoes and gravy, cooked vegetables, and a salad for a reasonable price. The food is down-home good, with good American dishes and a chilaquiles plate that will knock your socks off. For dinner, I just had a navy bean soup and a plate of cantaloupe with iced tea. I had eaten enough earlier. The important thing was that Martine was placated for making her eat strange “Muslim” food for lunch. History is full of strange byways and seemingly unsolvable mysteries. Why is it that, for a period of hundreds of years during the Dark Ages, the Middle Ages, and into the Renaissance, there were outbreaks of dancing fever. During these outbreaks people started dancing and kept dancing until they dropped dead, some of them from strokes and heart attacks, others from sheer exhaustion. The worst outbreak is recorded in Strasbourg, Alsace, during the year 1518. The city fathers even hired musicians in hopes that the dancers would dance until they got tired and just stop. But many did not stop, and these died. Although I do not have the mortality figures from the Strasbourg incident, one source indicates that up to 400 people were involved in the frenzy. A series of famines, resulting from bitter cold winters, scorching summers, sudden crop frosts and terrifying hailstorms, preceded the maniacal dancing, Waller said. Waves of deaths followed from malnutrition. People who survived were often forced to slaughter all of their farm animals, secure loans and finally, take to the streets begging. Smallpox, syphilis, leprosy and even a new disease known as “the English sweat” swept through the area. “Anxiety and false fears gripped the region,” Waller said. Waller therefore believes a phenomenon known as “mass psychogenic illness,” a form of mass hysteria usually preceded by intolerable levels of psychological distress, caused the dancing epidemic. If there is a scientific reason, why have there been no outbreaks in Europe dating from the time that the Christian religion ceased to play such an important part in the lives of the people? The anxiety and fears are still present to some degree. (Isn’t that why some people vote Republican?) But the religious trigger is absent. According to the Discover.Com website cited above, there have been similar outbreaks in Africa as recently as the twentieth century, and even a strange reaction in Belgium involving hysteria over soft-drink consumption. Now I know that, if Romney is somehow elected President, the ultimate cause will be a mass psychogenic illness caused by Karl Rove, Faux News, and Republican spin doctors. What’s With the Zombies Already? No, Wait, That’s Just a Republican! Until George Romero’s 1968 film The Night of the Living Dead, zombies were simply thought of as Voodoo-reanimated corpses. A good example is the character (if it can be called one) of Carrefour in Val Lewton’s lyrical I Walked with a Zombie (1943). Then, too, there was Victor Halperin’s early White Zombie (1932) starring Bela Lugosi. Also zombies (or was it vampires?) played a role in Richard Matheson’s 1954 novel I Am Legend. But it was Romero who really got the ball rolling and transferred the concept from an African or Haitian context to the general population. And the idea took hold, especially among the young who, perhaps, saw zombies as a metaphor for the breakdown of civilization and, perhaps, the mindlessness of an older generation that won’t let the young get on with their lives. In any case, now that the Twilight novels of Stephenie Meyer have blunted the whole concept of vampires for young males, it is perhaps natural that they moved on to the zombies as the new thing in horror. It was only a matter of time before the concept of a zombie apocalypse was born. What happens when the zombies threaten to attack en masse? 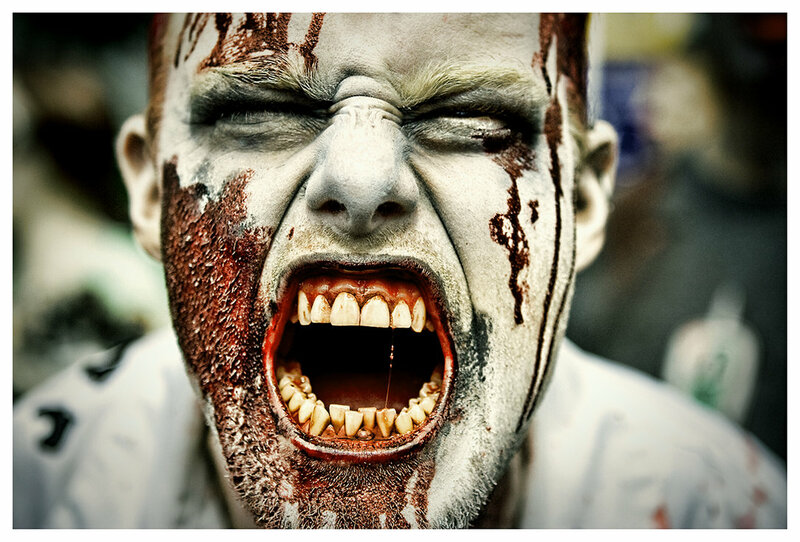 Even the august Centers for Disease Control (CDC) got into the act by issuing a tongue-in-cheek website entitled Preparedness 101: Zombie Apocalypse. Actually, it was a shrewd move because, if you are prepared for a zombie apocalypse, you are prepared for any eventuality. Looking around me at America today, I see little chance of a zombie apocalypse. I think most Americans—even dead ones—are allergic to brains, whether devouring or even using them for anything more sophisticated than supporting a hat. Photo credit: I hijacked the above photo from a website entitled You the Designer, which has thirty-seven zombie photos for your amusement and delectation.